The Codename New Cuffe Parade SmartMove is a pre-launch residential complex by Lodha Group which is set to launch in December 2018. The project consists of multiple towers stands 40+ Storey tall and is housed at Wadala East, Mumbai. 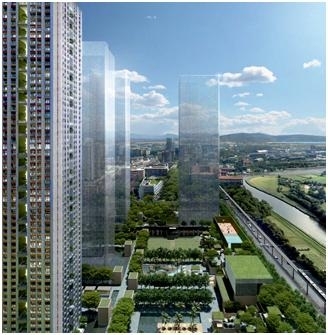 Lodha New Cuffe Parade having 1 BHK, 2 BHK & 3 BHK private garden residences that are being developed on 23 acres of landscape. "New Cuffe Parade Codename SmartMove" is one of the iconic venture holds ample of open spaces around the residences, 15 acres of land is dedicated to office tower and The Shri Ram Universal School (ICSE School ). The possession is being expected by June 2020 and the prices of these luxurious flats in New Cuffe Parade SmartMove start from 1.53 Croreto 5 Crore. The upcoming residential paradise by Lodha offers 11 Swimming Pools within the community where it also has 75000 Square Feet of Private Clubhouse with range of world-class amenities. Wilson Associates is the interior designer of this mega project providing exclusive lifestyle to the residences. This project offers sufficient layouts with the choices of homes 1 BHK homes (1.63 Cr onwards), 2 BHK homes(2.70 Cr onwards) & 3 BHK luxe garden apartments (3.99 Cr onwards). The Codename SmartMove complex welcoming 12 high rise buildings where 4 towers constructions are already has been started. These luxurious units are available with the carpet area of 500 Sq.ft to 1350 Sq.ft. Lodha Group is a prominent name in real estate sector in Mumbai. The builder is presently operating on over 34 million square feet of area space which account for more than 31 projects that are situated in and near Mumbai (from South Mumbai to Dombivali). Lodha Group is among India's top real estate builders recognized for their world-class business and residential projects. The builder has even entered into real estate business in London city, creating more luxury living. The builder has received end number of awards for their great work, they are responsible for changing the real estate situation of Mumbai and other cities of India. There are numerous reasons to opt for Lodha Codename SmartMove project that it is the most well-connected location and will have multiple options for schools, retail and offices. The key destinations at Wadala can be accessible via Road & Rail network. All the commercial hubs of Lower Parel, Bandra Kurla Complex, Thane, Airoli & Mahalaxmi are at the reach of 10-20 Minutes. Wadala East was primarily developed as an industrial locality with numerous electrical industries dotting the area but over the past few years, however, a large number of residential complexes have been developed such as Dosti Estate, Dosti Acres, Bhakti Park and the newest residential project named "Lodha Codename New Cuffe Parade SmartMove". The upcoming monorail will connect it to Lower Parel where one can reach within just 20 minutes. The elevated freeway will enable commuters to reach the business district of Fort in less than 20 minutes. Lodha Codename SmartMove is located near IMAX Dome at Eastern Freeway, Wadala East, Mumbai. Schools –Ryan International High School, C.B.M High School, DevkibaiBhojrajChanrai School, Loreto Convent School. Restaurants – Global Punjabi, Garcias Pizza, Sadanand Lunch Home, Peninsula Restaurant. Bank/ATMs – ICICI Bank, State Bank of India, HDFC Bank, IDBI Bank, Axis Bank, Yes Bank. Hospitals –Joshi Hospital Centre, Sanjeevani Medical Centre, Municipal Hospital, AdityaJyot Eye Hospital, RCF Hospital. Shopping Mall/Centre(s) – R.M Shopping Centre, Cubic Mall, Kalazo Fashion, DMart. Movie Theatres –Carnival IMAX, Ashish Theatre, Movie Time-Cubic Mall.